Manufacturer Genelec has roots as deep as time in the pro-audio market, predominantly with huge active studio monitors of awesome perfection for diction and clarity. Yet it has been making quiet forays into home cinema/small studio-friendly areas for some years now – and this array is its smallest yet. Our test system uses the dinkiest satellite available, the 6010A and the stumpy 5040A subwoofer. 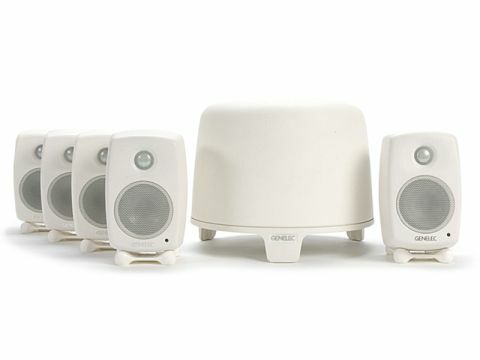 While this Genelec package can be used in a home cinema setting I suspect it will ultimately find its way into the homes of music business types familiar with the brand. I was told that The Prodigy take a set on tour to mix with, but I reckon it's a stereo iteration – they'd need a roadie with a brain the size of a planet to set up a 5.1 system. The woofer is the hub. First, you need to input via a 3.5mm tip-ring sleeve stereo jack if you want two-channel and then connect onwards to the sats via a pair of phono cables. But if you want 5.1 surround, you'll need a six-way phono loom from your source to wherever you put the woofer, and then plug in each of the five surround speakers with their own phonos – and, of course, their own mains lead. Compare that with the one phono lead for bass and five speaker wires of a passive system – this solution seems an untidy and costly madness. You could gouge out channels in your walls for wires to hide in, mount the satellites on funky wall brackets, and plug them in to custom install style sockets if you wanted – they'll look smart as hell – but I just cannot see that happening with a system of this size and price. In the streamlined world of modern AV, the wires needed here are a major issue, but one that has always been there with active speakers. The benefit of the active design is that cabinets can be made smaller, and efficiency and clarity is improved, but while these are indeed tiny, they lack level and depth; for all its tonal accuracy the output is just too weedy. This Genelec system is beautiful to look out, but it's an awful lot of money for a very small slice of AV. Don't get me wrong, these boxes have nearfield monitoring accuracy, but they remain as exciting to me as a chisel. A well-made and sharp tool you use for work.